Manager Tony Pulis secured Crystal Palace's first back-to-back Premier League wins since 2004 as Cameron Jerome's first goal for the club gave them victory over Cardiff City. Ex-Cardiff striker Jerome headed home seconds after Fraizer Campbell had a header saved at the other end. Marouane Chamakh's volley sealed the win before Jerome was denied a second by David Marshall's goal-line save. Victory moved Palace level on points with 17th-placed West Ham. Fresh from securing his first win as Palace manager against West Ham in midweek, Pulis saw his side control proceedings at Selhurst Park to move within one point of Cardiff. The Eagles, who have been relegated in every season they have played in the Premier League, have taken 10 points from 15 available, while Cardiff have just one win in nine matches. The Bluebirds, who have not won since their south Wales derby success over Swansea, have failed to score in their past four away matches and will look back on Campbell's miss as key. That the striker's close-range header was saved by Julian Speroni just seconds before Jerome broke the deadlock underlined Palace's recent change of fortune. Jerome, who played 73 times for Cardiff, escaped the clutches of his marker and powered a downward header home after neat work by Jason Puncheon. Pulis claimed hard work should be a given from his players ahead of kick-off and in Jerome and Chamakh, he had two strikers willing to lead from the front. The tempo settled following a frenetic opening and Barry Bannan benefited from a Chamakh flick to fire wide, before Puncheon's solo run ended with a wayward drive. Cardiff, one of seven sides in the Premier League averaging less than a goal a game, improved early in the second period, but when Chamakh coolly volleyed home from 18 yards, a fourth win of the season looked beyond Malky Mackay's men. Cardiff's victory over Swansea in early November is their only win in nine matches. They now sit just one point above the relegation zone. Chamakh, the match-winner against West Ham, chested down Ben Turner's headed clearance and drove the ball into the bottom corner. Substitute Peter Odemwingie headed wide when well placed for the Bluebirds, before Jerome shot from close range to force Marshall into a save in a moment which called for the use of goal-line technology. Jordon Mutch tested Speroni from distance late on, but it was Jerome who again went closest to registering the game's third when he pulled a shot wide from inside the area. "We did very well. We started sloppy and they could have scored but it was a great save from Speroni. From that point onwards though I thought we dominated and deserved it. "Back to back wins doesn't half give a club a lift. "They're a good group of lads and we have worked a lot on shape and things I think are essential to give you a chance and the players have responded well. You've always got a chance if you get yourself organised. "We can't get carried away. We've a tough run of games now ahead of Christmas. Staying up is a massive ask and a massive task." "I think first five minutes we have a fantastic chance we should have scored. We don't and they go down the other end and score theirs. You can't allow teams their chances and not take their own. "I'm not particularly concerned at the lack of goals, if we weren't creating chances I'd be worried. We just need to get back onto it again and be clinical." To see a gallery of images from today's Premier League games go to the BBC Sport Facebook page. Match ends, Crystal Palace 2, Cardiff City 0. Second Half ends, Crystal Palace 2, Cardiff City 0. Attempt missed. Peter Odemwingie (Cardiff City) right footed shot from outside the box misses to the left. Assisted by Steven Caulker. Attempt missed. Jordon Mutch (Cardiff City) header from very close range misses to the left. Assisted by Craig Noone with a cross. Attempt blocked. Peter Odemwingie (Cardiff City) left footed shot from the centre of the box is blocked. Corner, Crystal Palace. Conceded by Ben Turner. Foul by Declan John (Cardiff City). Substitution, Crystal Palace. Stuart O'Keefe replaces Barry Bannan. Attempt blocked. Barry Bannan (Crystal Palace) left footed shot from outside the box is blocked. Attempt missed. Cameron Jerome (Crystal Palace) left footed shot from the centre of the box is close, but misses to the left. Assisted by Barry Bannan with a cross. Delay in match Daniel Gabbidon (Crystal Palace) because of an injury. Foul by Andreas Cornelius (Cardiff City). Mile Jedinak (Crystal Palace) wins a free kick on the left wing. Attempt saved. Jordon Mutch (Cardiff City) right footed shot from outside the box is saved in the bottom right corner. Assisted by Steven Caulker. Attempt missed. Barry Bannan (Crystal Palace) right footed shot from outside the box misses to the right. Assisted by Marouane Chamakh. Attempt missed. Andreas Cornelius (Cardiff City) left footed shot from the left side of the box misses to the right. Assisted by Peter Odemwingie. Attempt missed. Damien Delaney (Crystal Palace) header from the centre of the box is too high. Assisted by Barry Bannan with a cross following a corner. Corner, Crystal Palace. Conceded by Steven Caulker. Attempt saved. Cameron Jerome (Crystal Palace) right footed shot from very close range is saved in the bottom right corner. Assisted by Kagisho Dikgacoi. Attempt missed. Kagisho Dikgacoi (Crystal Palace) header from the centre of the box is close, but misses to the right. Assisted by Barry Bannan with a cross following a corner. Attempt blocked. Cameron Jerome (Crystal Palace) right footed shot from the right side of the box is blocked. Assisted by Mile Jedinak with a headed pass. Substitution, Cardiff City. Andreas Cornelius replaces Fraizer Campbell. Attempt missed. Peter Odemwingie (Cardiff City) header from very close range misses to the right. Assisted by Jordon Mutch with a cross. Steven Caulker (Cardiff City) wins a free kick in the defensive half. 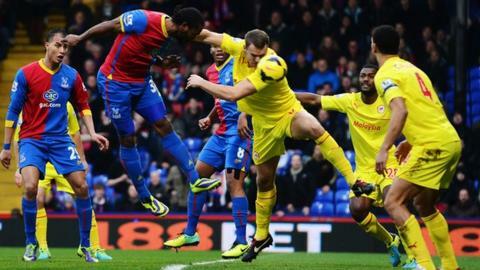 Foul by Cameron Jerome (Crystal Palace). Attempt missed. Craig Noone (Cardiff City) left footed shot from the right side of the box is close, but misses to the right following a set piece situation. Substitution, Cardiff City. Peter Odemwingie replaces Kim Bo-Kyung. Kim Bo-Kyung (Cardiff City) wins a free kick on the right wing. Goal! Crystal Palace 2, Cardiff City 0. Marouane Chamakh (Crystal Palace) right footed shot from the centre of the box to the bottom right corner.